We have learned about the Neuro linguistic programming (NLP) from Mr. Faizal Kamal. The words NLP derive from three distinct words which are neuro, linguistic and programming. Neuro refers to the brain and neural network that feeds into the brain. Linguistics refers to the content, both verbal and non-verbal, that moves across and through this pathway, while programming is the way the content or signal is manipulated to convert it into useful information. It is a field of study that attempts to build a set of transferable skills by programming the unconscious mind. In other terms it is the use of science and art to maximize an individual achievement. In the program, we learn lot about unconscious mind to break the limit of logic. We have learned about how to forget the bitter memory from the past, how to increase individual strength and confidence and also how to overcome phobia. The person (let say, miss A) that want to test their sensitivity have to sit on the chair, close her eyes, and put their mind in alpha mind (calm and concentrate). While miss A closed her eyes, the two other persons have to give different signal of touch and sound to make the miss A can identify and differentiate between them. At this stage, while giving the signal and hint, they can tell their name and miss A have to remember and differentiate the signals. After that, the two persons will once again give their specific signal without telling their name, and miss A have to guess the identity of the person. The process will occur repeatedly and the numbers that miss A guess correctly will be counted. The type of person of miss A will be known by the number of correct guess. An auditory person usually has strong administrative skills. They listen to people speaking to them and don’t forget what they have been told. They listen for sounds, directions and cues. When addressing an auditory person, it is important that the voice sounds interesting. Changes in pitch and volume will be noticed and they more interested and easily digest information from sound. Some auditory listener does not look in the eye of other when speaking, but do not be offended because they are listening to the sound of your voice and what you have to say. The second type of person is the visual learners. they need to “see” in order to understand. True visuals may have poor or non-existent auditory skills. They tend to not remember or identify things just by listening to it unless they see it visually. When speaking to them, it is better to show some body language or doing eye contact with them and when assigning tasks, ask them to write it down. 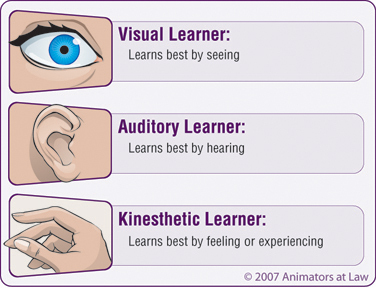 The final learner is the kinesthetic, or one who learns by touch. They gain knowledge by sight and touch. Kinesthetics are uncomfortable with constant eye contact so glance down to the right or left once in a while when in conversation to maintain a level of comfort. Kinesthetics will touch others and their surroundings in order to understand what it is they may be seeing or hearing. When speaking with a kinesthetic, use feeling words and ask “how does that feel”, “does that make you feel warm or cold”, or “how does that grab you” to help to “get the feeling across”. So, from the activity, find out what types of learner you and your friend and try to use the knowladge to improve yourself as well as how to communicate with your friend.